Bonnie Langford was bad, Billie could be worse. Why? “Because she wants to” . Save us! Get Maxine Peake (Shameless and Dinnerladies) instead. Another quiet week. I had a wander around Brixton in the rain last Wednesday followed by a few beers with some ex-Netscallies at The Market Porter by London Bridge. Everyone seems to be doing very well, which is as it should be. The flat sale seems to be moving along, no date for the survey yet, but they’ve got a couple more days. * Underworld – pretty poor vampires vs werewolves shooty flick, made only just bearable by Kate Beckinsale wearing a rubber catsuit throughout. * Love Actually – chintzy Brit Rom-Com thing. Not as bad as I’d feared. * In The Cut – Meg Ryan thriller which is surprisingly sexually explicit in places. The server that this site is hosted on will probably be moving later in the week. Shouldn’t cause more than a few hours of downtime while all the DNS re-aligns. It’ll be moving to a new uk colo service run by a former colleague of mine. (Very reasonable rates etc etc). Since I finished work, and more so since we put the flat on the market, I’ve not been going out very much. As a result, I’ve not had much to write about here really. Trying to keep busy I’ve set up a site dedicated to the old Telecom Gold Noticebd with some pictures and a message board. I’m sure anyone who wants to would be welcome to join in. I intend putting up more pictures and maybe a history of the Noticebd. Popped into town and met up with my brother, Nick, last week. It made a change to go out, and try out my pre-pay Oyster Card which seems to work well. I still need to find out when the new rules kick in about it only charging you the price of a Travelcard, if you could have made all the journeys using one, and when the buses take pre-pay. We’ve had 7 viewings of the flat so far, with another 2 due in the next hour. We’ve accepted an offer, but you never know what’s going to happen with the other viewings. Better make myself scarce, so I’m going for a wander around Brixton. Christopher Ecclestone is to play The Doctor in the new TV series of Doctor Who . Having seen him in lots of film and TV, I think he’ll make an excellent Doctor. He’s previously worked with Russell T. Davies, the new writer/executive producer, on The Second Coming which got very good reviews (though I didn’t see it myself). I’ve no idea whether I’ll be in the country when the show finally airs, but I think he has the potential to be one of the great Doctors, up there with Tom Baker. Here’s hoping! I’ve been meaning to get around to this for ages. 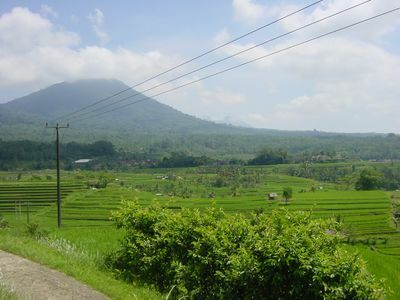 I took a load of pictures of rice terraces in the North of Bali, when Vic and I were on our honeymoon last year. I’ve stitched a bunch of them together to make a Quicktime VR panorama, which can be seen by clicking on the picture below..
It’s a bit on the large side (1.7mb) and you need Quicktime and the VR plug-in so my apologies for anyone on a slow link. One of the blokes next door has had a Windows 2000 PC and ADSL for a couple of weeks, and gave me knock earlier in the week as the PC won’t boot properly. On further inspection, the machine seems to be completely virus-ridden. Putting it through the hoops of AVG Sophos and F-Prot turned up 19 files infected with 6 different viruses which I cleaned out. Running AdAware found a bunch more SpyWare too. But it still wouldn’t boot. It’d get as far as the desktop wallpaper and just sit there. Using Alt-Ctrl-Del and Task Manager it was possible to kill the Explorer.exe process and start a new one, but something else was obviously up. Looking through the registry with RegEdit, having cleaned out an earlier virus which stops you using RegEdit or MSconfig, I found that there were multiple entries in the “Run” and “RunOnce” sections of HKLM/Software/Microsoft/Windows/CurrentControlSet titled “winlog” which were all running something called “winregedit.exe” from the /WINNT/System32 directory. I removed the entries and rebooted but they reappeared, so they were most likely up to no good. Killing the winregedit.exe processes and removing the registry entries again seemed to sort things out. A quick Google didn’t show up anything significant about winregedit.exe, but looking through the files with a text editor revealed that the file was a virus or worm. The text strings indicated that it was looking for CD keys for various games, connecting to an IRC channel and generally being bad. I did a search of the anti-virus sites but none of them listed this particular virus, though the Yaha strains looked similar. I removed winregedit.exe and rebooted; everything appeared clean now. I’ve now setup AVG for him, and installed Zone Alarm to protect him from future infections. Having my own machines behind a firewalling router means that I don’t suffer from any network-based attacks from the Internet, though I do get the usual selection of email viruses (which AVG picks up). So, if you do have a machine connected to the Net (especially a Windows machine), make sure you have a firewall of some description and make sure you have up-to-date anti-virus software, and also choose strong passwords for your machine as some viruses/worms gain access by guessing network passwords. The TG Noticebd reunion went off fantastically well, though Vic and I arrived a little later than originally planned. Lots of old faces, and a few people who were from before my Noticebd era. So many folk armed with cameras naturally resulted in lots of digital pictures and a few folks have donated retro pictures from the heyday of the Noticebd It was great to see so many of the crew, and to see how little most had changed. Chesh even turned up later than everyone else, just like he used to 15 years ago. I’m hoping that there’ll be another Eyeball rather sooner than the last 10 year interval. I’ve also created a new message board for the old TGers; if anyone wants access to it, drop me an email as I don’t want it to be publically visible just yet. Vic and I worked off our hangovers by tidying the flat up ready for putting it on the market. So we’re now officially “For Sale”, in case anyone out there wants to buy a 2 bedroom garden flat in Brixton. Just across the road from where I live, there’s a mural painted on the side of a house. It’s been there since I moved here in 1992. In fact, I think it dates from 1985. In all that time it’s survived untouched. Until about 6 months ago, when a tagger decided that he/she would enhance it by spraying their tag on it in black paint. The mural really is quite a work, with a real window being incorporated into the picture, along with swans, herons and a watermill. Why they’ve decided to damage it after 18 years, I’ve no idea. Deeply sad. Everything going well, our flat should go on the market on Monday. We’ve had some “issues” with the estate agents though. We phoned them to say we’d like to put it on the market last Friday, and they sent though some paperwork which arrived on Saturday. As Vic is going through a redundancy process and we needed to sort a couple of things out, we didn’t immediately complete the paperwork. On Wednesday and Thursday the estate agents called to say they’d arranged viewings, despite them not having any paperwork, details, keys or permission. Vic sent them off with a few robust words. We’ve now agreed they can arrange viewings from Monday, when they come around to take details, photos and get keys. I’m not looking forward to future dealings with the agents, but I guess they’re a necessary (and expensive) evil if we’re to sell with minimum hassle. The floor guys should be in in the next week or so to fix up the hallway floor. They did try to make out we need to replace the floor in the backroom too, but I just don’t have Â£1100 quid and time to shift all the furniture. Last minute tidying up this weekend then. I installed MT-Blacklist the week before last after getting hit with 5 spam comments. Since then it’s stopped 12 more spamming attempts, so it’s doing its job very well. For those who don’t know, comment spamming has become a problem on blogs because it’s used as a way of pushing up web search rankings. Comments on various sites with links pointing to an online casino/viagra store etc, push the destination site up in the rankings. The spammers use search engines to find blogs, and then post repeated comments which often appear innocuous enough (e.g. “Great site!”), but have links pointing to the spammer’s site. A similar thing is done by spoofing referrers, so that sites which show recent referrers end up advertising dodgy sites. I keep my web stats unlinked from my site, but have noticed a bunch of spoofed referrers recently. For the uninitiated, every time you click on a link, your web browser sends the address of the page holding that link to the destination site when it requests that page. Most web servers can record the referrer address, which can provide useful information about where visitors to a site are coming from. Some sites process the referrer logs and display the results on the site, hence the benefit of spooking the referrer field in a request. It’s done by using a program to act as a browser, which sends false referrer data in the request.